Yupo WHITE MIXED MEDIA 9x12 144lb Paper Pad 31587 at Simon Says STAMP! 31587 This item is on reserve until If you would like to reserve this item now, you may purchase it now with the rest of your order. We will hold your order now and ship your entire order as soon as this item is back into stock. If you would like your order to ship now, please place this item on a separate order. Success, Yupo WHITE MIXED MEDIA 9x12 144lb Paper Pad 31587 has been shared! An ultra-smooth, slick, incredibly strong, non-porous polypropylene substrate that repels water. Work in several different mediums to achieve unique and creative results. Painting or drawing on this surface will require some adjustments by the artist. The surface may be wiped clean to restore the original white of the sheet, making it an excellent surface for beginners or for advanced and experimental artists wanting to capture nuances, patterns, and shapes. Yupo exhibits a unique lifting quality so it is possible to redo specific areas over and over again, or build up layers of paint like an oil painter working on a canvas, and then take them off to reveal the white of the sheet. Yupo paper is a unique alternative to traditional watercolor papers. It's an incredibly durable, stain-resistant, non-absorbent synthetic paper that holds ink and watercolor with razor sharp precision. This extraordinary surface also resists tearing and buckling and it remains perfectly flat. Remember that water activates the paint, even paint put down months ago. Allow YUPO to dry completely. Spray YUPO with a finishing spray to seal and protect it. Only use a sealant when your work is complete, as rework and touch-ups become difficult to do after sealing. Material is 100 percent polypropylene, and is neutral pH, acid-free, waterproof, and recyclable. Can be used for acrylic or watercolor paints, alcohol inks, oil pastels, pencil, graphite, or printing techniques (monotype, offset, silkscreen). 9 x 12, 144 lb., 10-sheet heavyweight white pad. Currently, the largest manufacturer of synthetic papers in the Western Hemisphere, YUPOs technical superiority, unique attributes, and the many applications for industry and design make YUPO the only choice and the best choice. 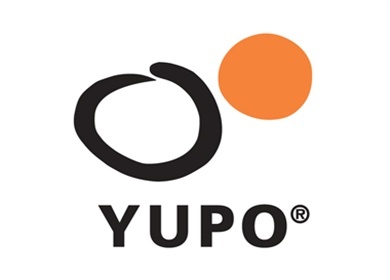 Yupo Corporation America was founded in 1996 as a wholly owned subsidiary of Yupo Corporation, headquartered in Japan. Through extensive research and development, Yupo became an industry leader in its production and found that the waterproof, 100% recyclable, tear- and chemical-resistant synthetic had applications in the print, design and packaging worlds that were virtually limitless!